It’s in the nature of interior design to alter with the times. The bathroom space is definitely one aspect of home decoration and layout that has definitely changed a great deal over the past years. For instance, if you’re vying to purchase an old home, you should know that the average surface for their bathrooms stands at a measly 5-by-8 feet. That’s very little space to go on, which is why today, we bring you 13 great small bathroom ideas. There are plenty of décor options to choose from in the gallery below – and they go wildly beyond the tested and true tricks in the book. You already know small bathrooms need plenty of clever storage space and ample illumination; but what else can you do when you’re in dire need of more room, in what is perhaps the most important room in the house? The above photo actually includes several small bathroom ideas, such as the clear shower and the counter space. However, it’s all about storage room – and the vanity, in particular. In this example, the designer paid special attention to the layout of the small space, and moved the toilet, above which he placed the vanity. Tucked away into a handy niche, this makes the storage space much more accessible, without eating up too much room in the bathroom per se. Black in a small room?! You’ve got to be kidding, right? Not according to acclaimed designer Melissa Miranda. She chose to deck out this sleek, contemporary small bathroom in coal black. She then accented the height of the space with a designer wallpaper, fittingly titled Woods. The edge this small bathroom came with was the ample natural lighting, which allowed for the bold choice of wall color. 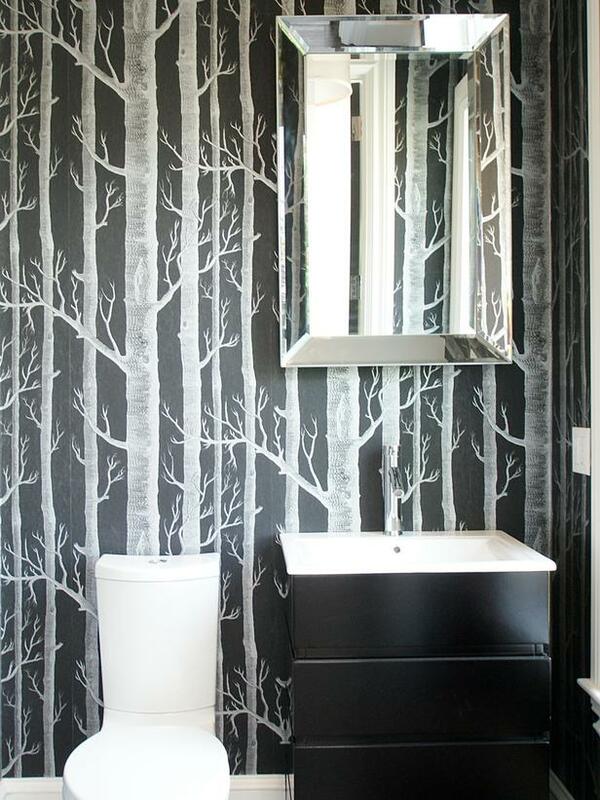 Woods wallpaper available at Cole & Sons. 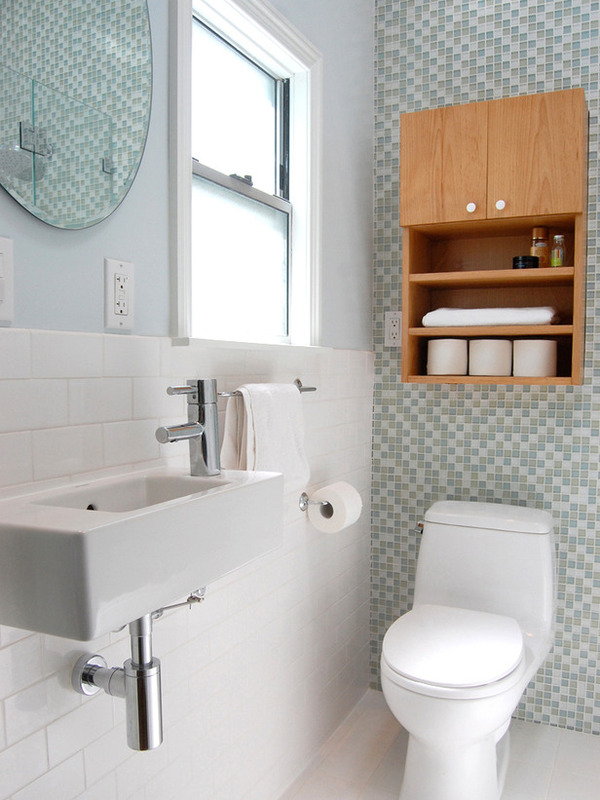 Yet another popular misconception is that mosaic tiles don’t fare well in small bathrooms. However, that’s exactly what designer Jennifer Jones managed to prove wrong with this white and blue modern bathroom remodel. The bathroom pictured above stood in a cramped floor plan as it was, so the mission was to maximize what little space there was available. The solution: moving the toilet closer to the rear-wall, using a wall-mounted sink – and, perhaps most importantly, covering the walls in white and blue mosaic tiles, which create movement and draw attention to the skylight and the tall ceiling. Minimalism is one of the best small bathroom ideas. It can look sleek, coherent, and elegant, all at the same time, while also saving you precious space. That’s exactly what’s going on in the above bathroom, designed by Debbie R. Gualco from Reynolds Gualco Architecture & Interior Design in Sacramento, CA. This was also a remodel, which updated the look of a 1980s style powder room. The small bathroom vanity is inspired by a traditional Japanese chest called the kaidantansu. The rich color palette adds depth to the design, but also makes the walls look further removed. Much like the kitchen, the bathroom, too, can act as the heart of the house. And, in the case of this bathroom, designed by Andreas Charalambous, it’s a heart of glass. Not only is the shower clear, but the illusion of space is further enhanced by the layering of transparent and reflective surfaces. There are so many mirrors and windows in this room, that you can literally see from one end of it to the next. This manages to enhance the space, as well as make it seem ampler. 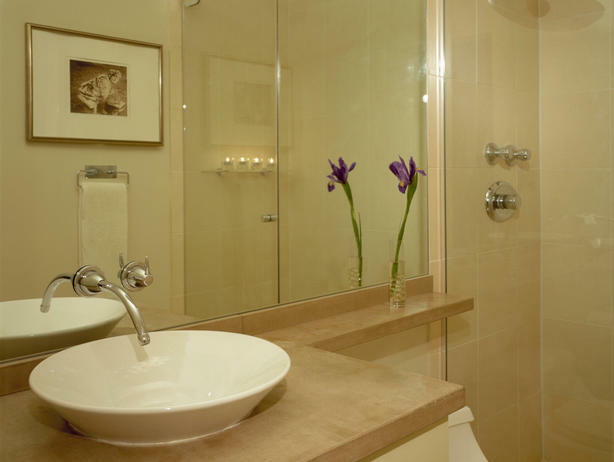 Smartly using the glass and mirrors is one of the best small bathroom ideas. There are many great small bathroom ideas in the powder room pictured above. 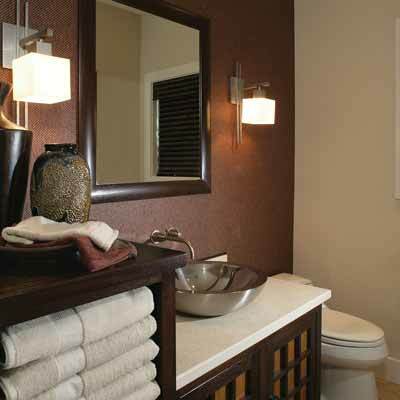 One of the most innovative ideas for small bathrooms is the task lighting, placed in all the key spots. 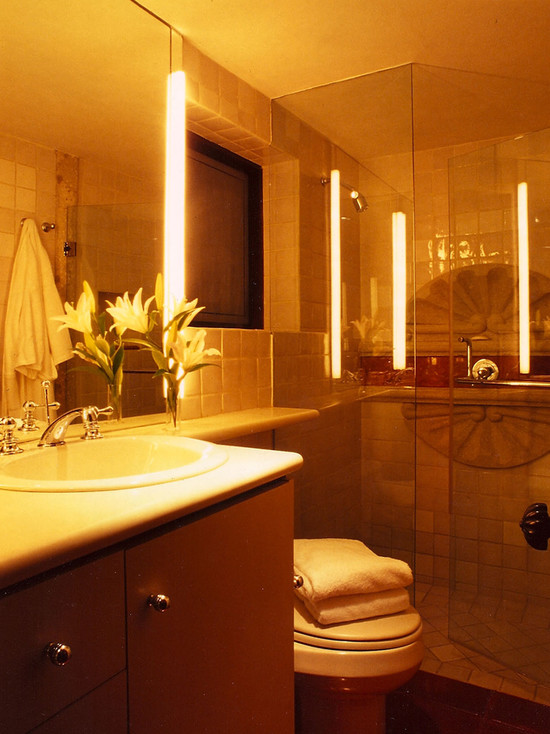 The light bounces off the large mirror, which has no frame, and the toilet area is separated from the rest of the room via an elegant marble separator. There’s a curbless entry to the shower, which is also a great idea for small bathrooms. But what really intensifies the amplitude of the space is the use of horizontal lines. They create dynamism, as well as continuity. 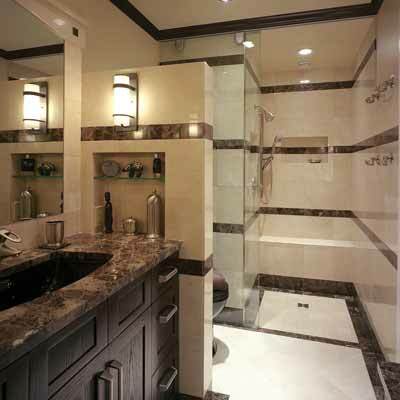 This bathroom was designed by Gary Hentges, from Hentges Construction, Inc., of Urbana, IL. Nothing ruins an otherwise perfectly usable small bathroom like clutter. Perhaps this is why the owners of this one wanted to “keep it simple and do it well”. That’s what designer Gary Hentges delivered. The entire bathroom is decked out in cherry and limestone. The curved front of the vanity saves room and adds storage space, thanks to its two ample and deep drawers. The vanity also comes with double extension drawer slides, adding more small bathroom storage. Soaker bathtubs are available at multiple online retailers. 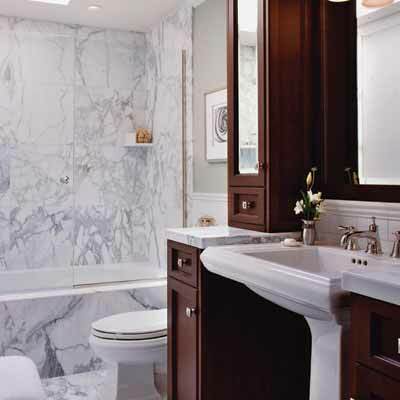 The myth says pedestal sinks ought to be avoided in small bathrooms and powder rooms. However, designer Lauren Jacobsen has managed to prove that they are among the good small bathroom ideas. Jacobsen, who specializes in traditional and rustic designs, worked a pedestal sink into a tiny powder room. She chose to offset the otherwise dark color of the walls with this small and delicate sink. Thus, she made the space seem ampler visually. At the same time, the richly colored and textured walls make the room seem at once warm, cozy, as well as princely elegant. There are several great small bathroom ideas out there created by Keri Davis, from Lake Oswego, OR. The first thing you notice in the image above is the overall home spa feel, enriched by the glass shower, warm and elegant tones of wood, and white marble tiles. It’s important to mention that this particular bathroom stands enclosed by bedrooms on both sides. It was literally impossible to increase its surface. Instead, the homeowners and designer opted for an overall light tone of the walls, as well as for the visual ‘trick’ of vertical cabinets, decked out in mirrors. The bathroom above, designed by Joseph Pubillones, puts several small bathroom ideas into practice. There’s storage room concealed behind a mirror. The mirror is frameless. 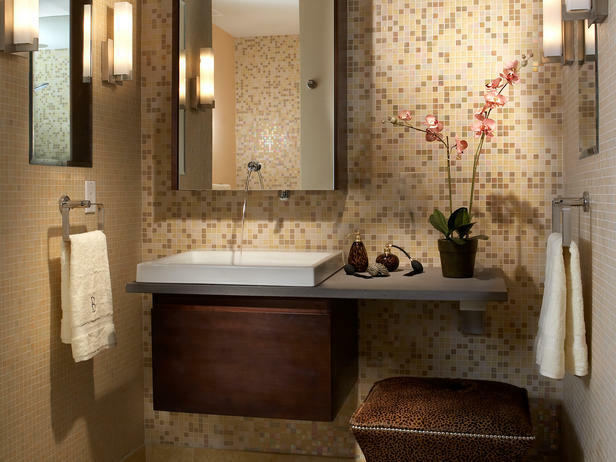 There’s a blend of light and rich colors on the walls and the mosaic tiles add dynamism to the space. But, best of all, the kitchen sink, counter, and vanity all float above the ground, adding visual real estate to the room. The floating vanity is a particularly great addition, with its minimalist, contemporary design, complemented by the warm tone of the wood. There is actually one advantage to owning a home with a small bathroom. Since you’ve got smaller surfaces to cover, you can afford to go (relatively) wild with the materials you use, both in terms of quality, as well as in terms of price. 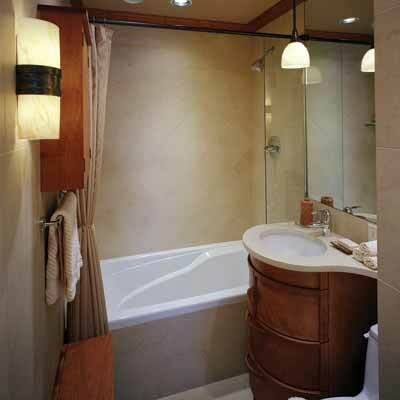 The above bathroom offers great ideas for small bathroom. 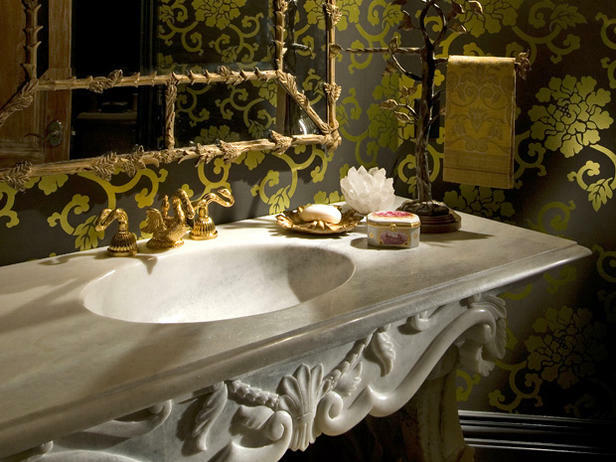 Decorated by designer Shelly Reihl David, it sports a lavish sink, made of hand-carved marble, a wall with metallic damask patterns, a mirror with a gilded frame, and sconces made of amber crystal. It might all be a bit too much for those who prefer minimalism, for instance, but it certainly is in good quality. We’re all about debunking myths, here at ModernOctopus. Just like we’ve suggested trying on darker colors for the walls, or pedestal sinks, we also suggest you forget all about the rule that says bold graphic patterns overpower small spaces. 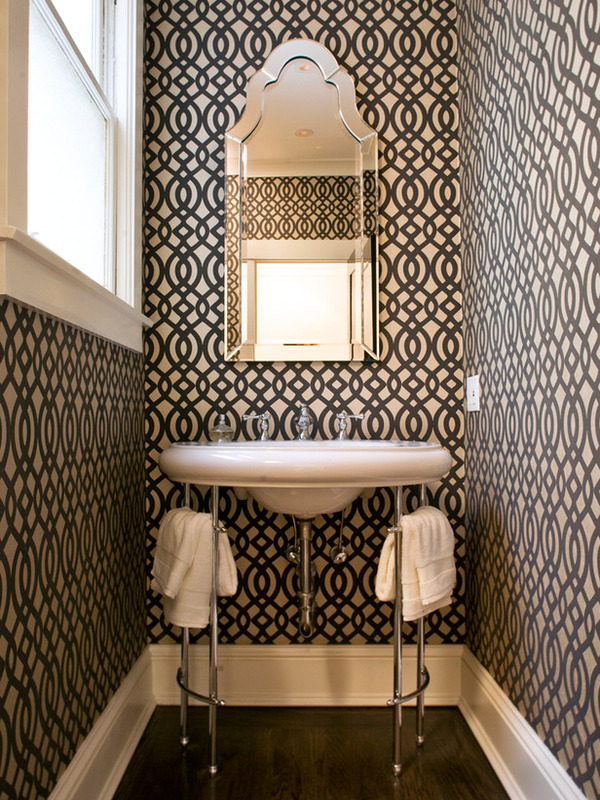 In smaller bathrooms, wild patterns like the one above (designed by Jennifer Jones) take up a relatively small amount of space. So, you can afford to go a bit wild and fun, break the monotony, and try a pattern you might consider too over-the-top to use in an ampler space. Not only is the Hacienda-style bathroom above very unique, in terms of style and personality, but it also makes great use of warm color accents. Check out the counter, topped with red travertine rock, the lush draperies by the shower, and the amazing handmade tiles. 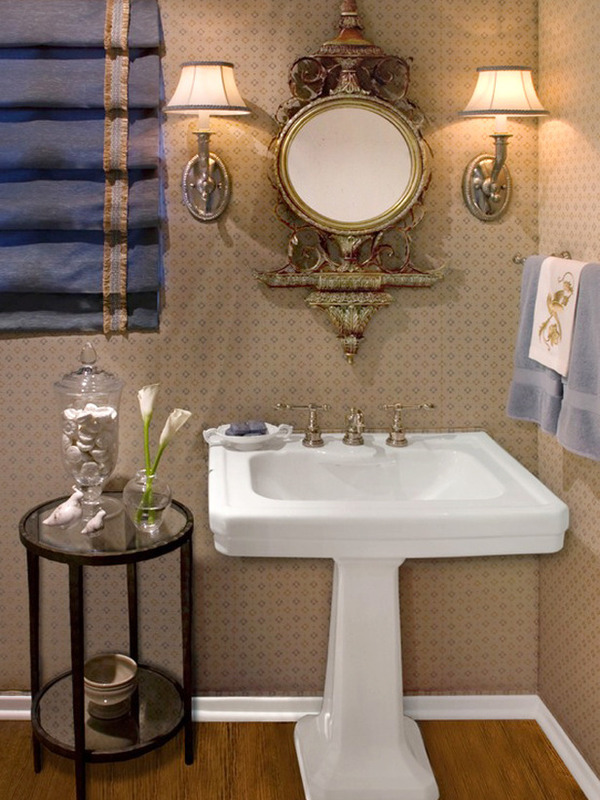 It’s all about Old World charm in this bathroom, designed by Leslie Ann Cohen, from Cardiff, CA. It goes to show that, when played off well, richer, darker tones can be some of the greatest small bathroom ideas. 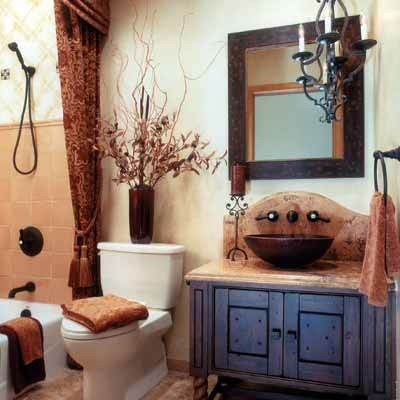 What about you: what are your tips and tricks for making small bathrooms look more appealing, dynamic, and elegant? What’s your favorite style of the ones featured above? Ever had to remodel a tiny powder room or bathroom? Do you have other great small bathroom ideas? If you have, don’t hesitate to let us know in the comment section.